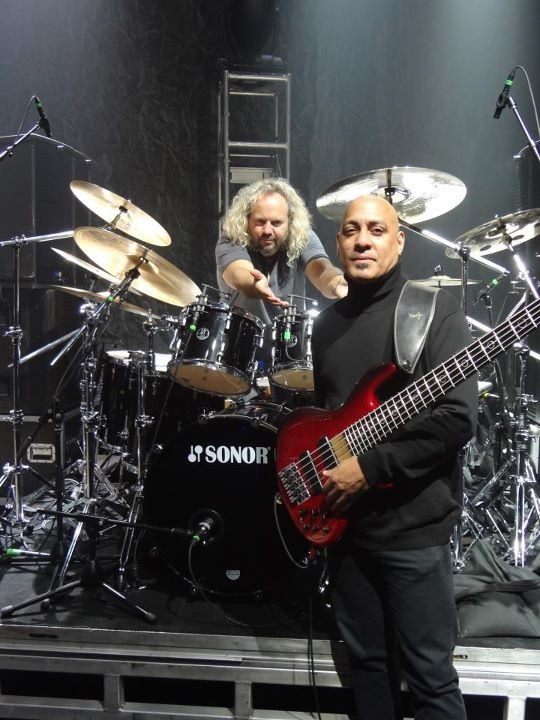 Carmine Rojas is the consummate bass sideman, and that’s not by accident. Over a career that has spanned four decades, the native New Yorker has laid tasty foundations for a long list of heavies that include Tina Turner, B.B. King, Stevie Wonder, Eric Clapton, Al Green, Herbie Hancock, David Bowie and Rod Stewart, for whom he served as musical direction from 1988 to 2003. Since 2005, Rojas been touring and recording with blues guitarist Joe Bonamassa, whose 2011 release Dust Bowl- as well as Don’t Explain, Bonamassa’s gritty soul collaboration with singer Beth Hart-Showcase Rojas’ ability to tap into a wealth of musical styles for any given gig. His secret? Respect, “If you’re going to do this and make it a career, respect it. It’s very sacred. Where the information comes from is spiritual. You have to be above yourself and respect the flow of energy and where it comes from. How’d you hook up with Joe Bonamassa? I have to thank [producer] Kevin Shirley for piecing this together, because at first, I wasn’t sure about being in a blues band. I didn’t know if it was going to be interesting enough. Buy it’s not about playing “Sweet Home Chicago” until we’re blue in the face. I get to throw some 6/8 in there just to clever it up. Iggy Pop’s original version of “China Girl” doesn’t even have a bass line. The day before we cut that song, the Rolling Stones’ “Under My Thumb” was on the radio. Brian Jones’ great vibraphone part has the same chord changes as “China Girl” –E to D to C. That’s where my bass line comes from. What prepared you to be a musical director for Rod Stewart? I learned a lot Carlos Alomar, David Bowie’s musical director for many years, who took me under his wing. He would mix genres all the time, like Latin with Rock. He’d say, “Let’s put [Nikolai Rimsky-Korsakov’s 1888 symphonic suite] ‘Scheherazade’ in this punk thing.” I’d be like “You can do that?” and he would say “Year,Sure-Just turn the groove around.” As long as it was in the pocket, I could do whatever I wanted with Carlos. I was never Limited. Ron Wood’s bass line on “Maggie May”: Masterpiece or mess? [Laughs] You can her Woody messing around and missing the root notes; that’s a brilliant, walking/country-western line that he put in a little rock flair into. I added my own thing to it’s the kind of line you can mess around with. I would throw in an extra 3rd somewhere or stay on the V chord for a while. I altered that line all the time. What’s the difference between backing an icon like Rod Stewart and a guitar hero like Joe Bonamassa? There isn’t really any difference, because I still play what I call “Across-the-boards” bass. Maybe with Joe I try to come up with more Andy Fraser-like parts, but I’m using the same spirit, the same techniques, the same aggressiveness, and I’ll add to it whatever I heard the day. My ipod stays on “Shuffle” all day long, and I play along with whatever comes on. If I hear something I like-even if it’s keyboards, horn parts and vocal lines-I try to figure it out and then us it in the show somewhere.